Looking for something fun going on this weekend? Here's a big list of family friendly things to do across the state of Utah. A very big thanks to America First for sponsoring this post. Did you America First credit union members receive special discounts just for paying with their America First Debit or Credit Card. Discounts include Megaplex theaters, Cowabunga Bay, Lagoon, and many more. Start planing your Summer Movies in the Park. Many cities provide a free outdoor movie. Summit County Fair (Coalville) - August 4-11; carnival, demolition derby, rodeo and more. Kane County Fair (Orderville) - August 4-11; includes kids zone, parade, carnival and more. Juab County Fair - August 6-11; includes livestock, rodeo, roping event and more. Alpine Days - August 6-11; includes tournaments, parade, carnival and more. Lindon Days - August 6-11; includes free swim, rodeo, parade and more. Weber County Fair - August 8-11; includes demolition derby, rodeo, entertainment and more. Millard County Fair - August 8-11; includes Charley Jenkins concert, Luau, tournaments and more. Harvest Days (Midvale) - August 8-11; includes parade, concerts, fireworks and more. Washington County Fair - August 8-11; includes live shark encounters, pirate ship playground, demolition derby and more. Salt Lake County Fair - August 9-11; includes rodeo, petting zoo, inflatables, movie in the park and more. The Friendly Island Festival (Salt Lake) - at Jordan Park. Includes art, entertainment and food. Cache County Fair - August 9-11; includes rodeo, entertainment, carnival and more. Summerfest (Bountiful) - August 10-11; Performers from around the world will share their dance, music, and culture at this free event. Fizz Fest (Daybreak) - August 10-11; includes live art, music, food trucks and kid crafts. Panguitch Lake Arts Festival - August 10-11; includes entertainment, pioneer games, story tellers, crafts and more.rucks, and kid crafts. 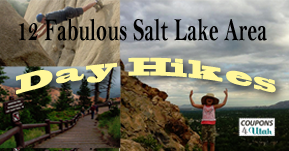 Craft Lake City (Salt Lake) - August 10-12 at the Gallivan Center. Tickets start at $5. Venture Outdoors Festival Runs thru Friday, August 18 at a different venue each week. This is a weekly series. This free, family-friendly event features live music, recreation clinics, guest speakers, giveaways, creative children’s activities and more. Tacofest (Salt Lake) - Saturday, August 11 at Union Pacific District. Get discount tickets for as low as $2.80 and kids are free. Kids Obstacle Challenge (Midway) - Saturday, August 11 at Soldier Hollow. Get discount tickets here>> and parents are free. Timpanogoes Big Band & Dance (West Jordan) - Saturday, August 11 at 7:30 pm at the Viridian Center. Includes Dance instructions and concert under the stars. Dog Days of Summer at This Is The Place (Salt Lake) - Saturday, August 11; bring your dog to the park and admission is on discount for just $5. Day of Hope Car Show (West Jordan) - Saturday, August 11 from 10 am - 2:30 pm at Veterans Memorial Park. 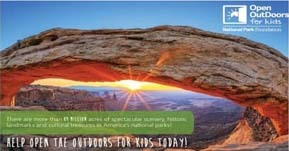 Heber Outdoor Festival - Saturday, August 11 from 9 am - 5 pm at Hamlet Park. This event is FREE to the public courtesy of our sponsors. Anglers & Outdoor enthusiasts of all levels are encouraged to attend this one-day event so they may learn new techniques and fine-tune their skills via free classes, clinics and demonstrations offered throughout the day by local industry experts. Weber County RAMP Committee is offering various FREE activities each Saturday for the Summer. Check out the Free activities for this Saturday here. MOA Family Workshops (Provo) – On any one Saturday of their choice families can take a guided tour of a current exhibition and create a fun, hands-on art project, free of charge. Arts, Parks and the Zoo - Get a coupon for places such as Utah Hogle Zoo, Red Butte Garden, This Is the Place Heritage Park, Utah Museum of Fine Arts and more. 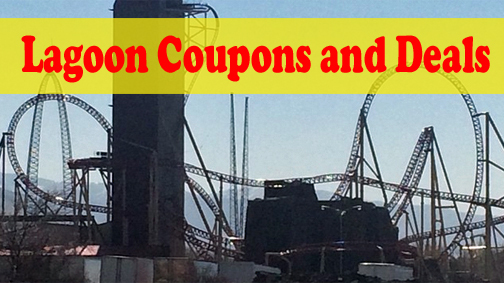 Go here for even more Hogle Zoo coupons. Utah Olympic Park (Park City) - Save on Adult and Children Gold Passes or their new Zip Tour! Heber Valley Train - Save 50% off on beautiful train rides through the mountains. Pass of all Passes - get the best price for a year of various attractions and sporting venues. 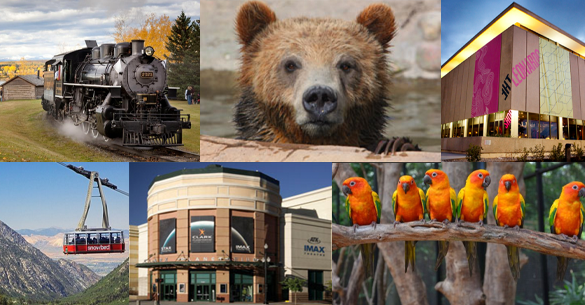 Now choose from options that also include Lagoon, Hogle Zoo, Museum of Curiosity and more! 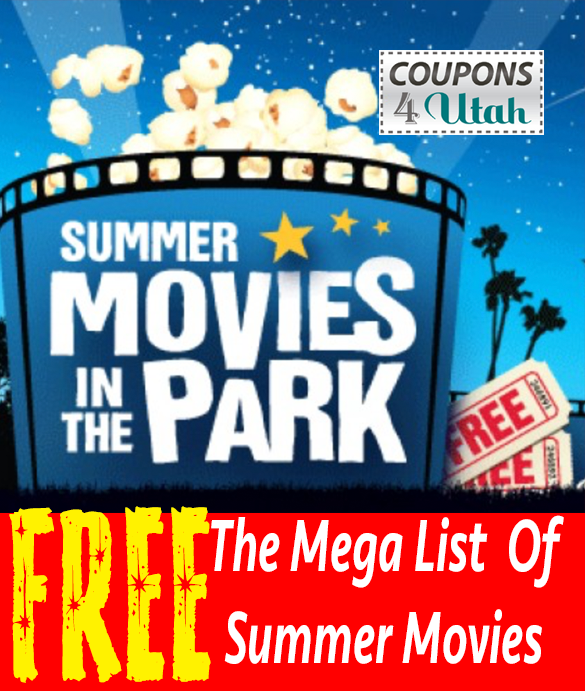 Salt Lake Seven Peaks Water Park - Discount tickets. FastKart in Salt Lake and Orem - Save up to 60%. Toad's Fun Zone - $35 (reg. $55) for a VIP package. Paintball (Multiple locations ) - $19 (reg. $60) for an all day paintball package for Four. Options available for twelve. All Day Indoor Paintball (Salt Lake) - $20 (reg. $37.98) for all day admission for two. Ice Skating at South Davis Recreation Center - $7 (reg. $13) for Two with skate rental. Options available for six. Grimm Ghost Tours - 51% off walking tours that explore haunted cemeteries and mansions. Brewvies Cinema - $10 ($18 value) for two movies and a popcorn. There’s a weekly Cinemark concession coupon on their Facebook page. Join Megaplex’s Newsletter Club and receive a FREE medium popcorn, or you can upgrade to a large for $1. Rocky Mountain Aquatics (West Valley) – Pay $9 ($20 value) for a 20-minute instructional scuba-diving experience for Two. The Crater at Homestead Resort – $22.99 (reg. $32) for a 40-min bath or swim with snorkling gear for TWO. Options available for six. Flowrider and iFly (Ogden) – $55 (reg. 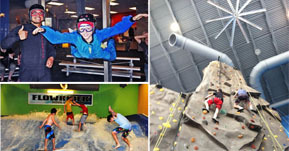 $89) for an indoor skydiving, surfing, and rock climbing package. Home2 Suites in Lehi - stay for one night for $79 (reg. $129-$139). Michael’s – Various crafts and activities. Home Depot Kids Workshop -offers a Free workshop, Saturday, Sepember 1 from 9 am – 12 pm. Go here to find a location and register in advance. 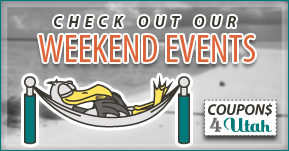 Barnes & Noble - Various weekend reading events for the kids. 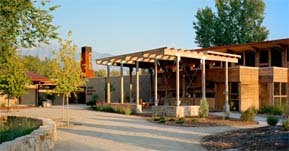 Williams Sonoma Free Junior Chef Class - Check for various cooking classes each Saturday. Suitable for ages 5–13. Contact your location to verify schedule. Home Depot – On Saturday, there is a Free DIY workshop at 10:15-11:30 am. Register online here. Get a 2 week free trial of HULU Plus. Normally HULU offers just one week, with this trial you’ll have a good chance to test it out. Hulu Plus members, get access to 1,000?s of commercial free movies and TV episodes. Watch as many as you like, there is no limit. After your trial period the cost is $7.99 per month. There is no further obligation, you can cancel anytime. Redbox – New Movie codes and specials will be update as they become available on this post here. Bookmark it or pin it. Events Calendar Do you want your event listed on our Utah events calendar? Getting on the list is simple, just fill out the form here to get started.